"These cookies are mixed differently from other cookies (like pie crust) but they are the best. These are the ones I grew up on. 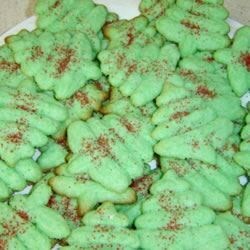 At Christmas my mom would add almond extract and green food color then make tree pattern." Mix the flour, sugar, salt and baking powder. Cut the shortening in until it resembles course crumbs. Measure the egg and add enough water to make 1/4 cup, beat together. Add egg and vanilla to crumb mixture; mix well. Put through the cookie press onto cookie sheets. Decorate with sprinkles or colored sugar if desired. Bake at 375 degrees F (190 degrees C) for 10 -12 minutes or until very light brown and set. Definately easy to mix up. As for taste - it was o.k., but we'd rather stick with butter over shortening. My husband thought it had a "shortening aftertaste"
Use butter not shortening! Butter makes all of the difference, the cookie will have a nice texture and taste. I make these every Christmas. They can be changed by just changing the extract flavor! this is by far and away the best spritz recipe i have found. easy to make and cookies turn out terrific every time. for a flavor twist try using butter shortening. excellent recipe!! !